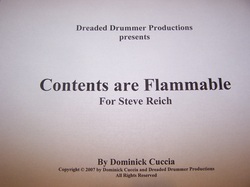 Dreaded Drummer gear, books & music are on the way. Please check back again before long…or after long! 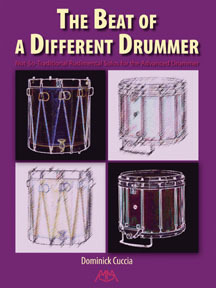 In 2003, Meredith Music Publications and Garwood Whaley published Dominick's book, The Beat of a Different Drummer. In the years since it was published it has become the new standard for "traditional" and "not-so-traditional" rudimental drumming. Three solos have been a part of auditions that won gigs with The Old Guard, numerous pieces have been used for college auditions, a number of rudimental championships have been won and the "not-so-traditional" genre has become a regular on recitals around the globe! Most drummers say, "if you don't own it, you need to!" To order, visit my friend, Joe Gillotti at Black River Music.